The 2008 Silver Eagle is special for two main reasons, once of which remained unknown to collectors for over a year after the Proofs were already sold out at the mint! The first reason is that the 2008 Proof was struck at the West Point Mint. West point had been established in 1937 as a bullion depository. It's just a stone's throw away from the U.S. army military academy. Over the years since it opened, so much silver was stored there that it became known as the Fort Knox of silver. As 2009 wore on, collectors grew increasingly uneasy, as the mint did not announce the sale of the 2009 Proofs. 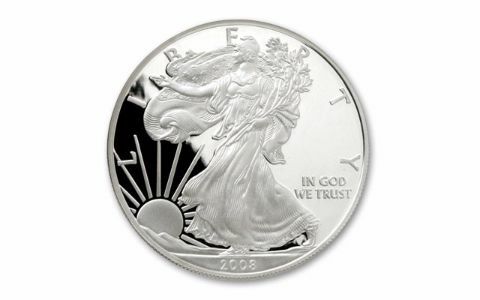 When the year closed, there were no Silver Eagle Proofs minted in 2009! 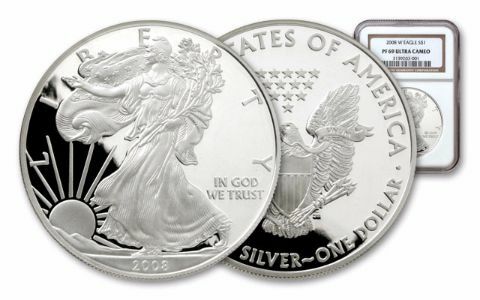 This caused a mad rush among collectors to get the 2008 Proofs, because no one knew whether or not Silver Eagle Proofs would ever be minted again. We recently purchased a small number of 2008 Proof Silver Eagles graded by Professional Coin Grading Service (PCGS) and Numismatic Guaranty Corporation (NGC) in Proof-69 (PR69, PF69) condition. 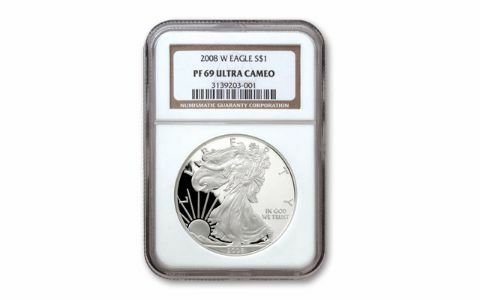 Don't miss your chance to secure your 2008 Proof Silver Eagles now, a coin many collectors are still scrambling to obtain. Grading service varies.